Dr. Sarah Rush performs a neurological exam on Leah Merriman in early March 2013. When Gina and Mitchell Merriman learned in December that their 8-year-old daughter, Leah, had a brain tumor, they were devastated. The Stow, Ohio, family immediately began a medical journey that would include MRIs and visits with multiple pediatric specialists at Akron Children’s. The initial jolt of bad news was tempered with some good news. First, Leah’s tumor was benign – although there would still be complications due its location. 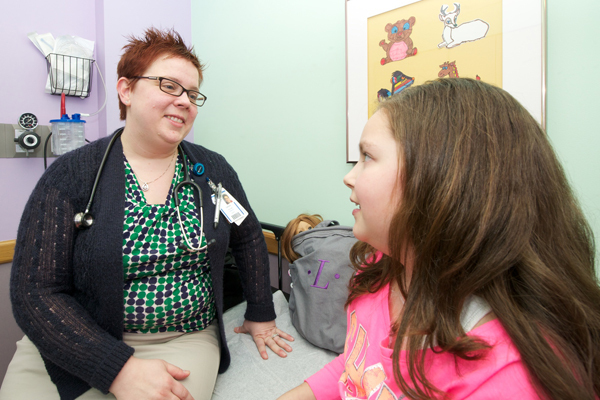 Shortly after the diagnosis, the Merrimans learned that a physician who specializes in brain tumors in children would be joining Akron Children’s Showers Family Center for Childhood Cancer and Blood Disorders. That physician, Sarah Rush, had even been studying Leah’s type of brain tumor during her fellowship program at Children’s Hospital Colorado. With her arrival at Akron Children’s, Dr. Rush is now heading up the hospital’s new brain tumor clinic for children and teens. She will work in close consultation with the hospital’s divisions of pediatric neurosurgery, neurology and neuropsychology. 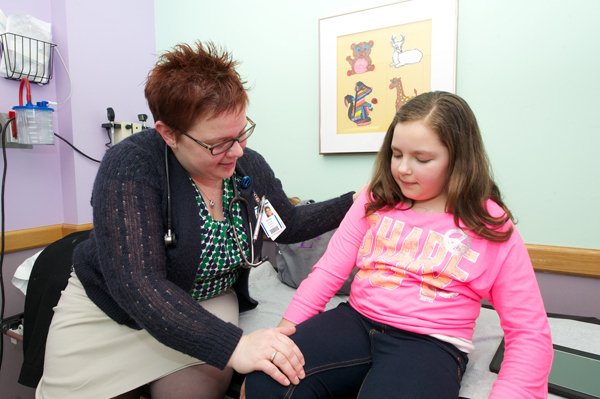 As a pediatric neuro-oncologist, her primary clinical interest is tumors of the brain, brainstem and spine. It’s been something of a homecoming for Dr. Rush, who completed her pediatric residency at Akron Children’s Hospital and served as chief resident between 2002 and 2006. She graduated from the University of Cincinnati College of Medicine and completed a fellowship in pediatric hematology/oncology at Vanderbilt University Medical Center, followed by her fellowship in pediatric neuro-oncology. Along with the advances in technology and treatments is greater recognition that children with cancer – and their families – need lots of support. 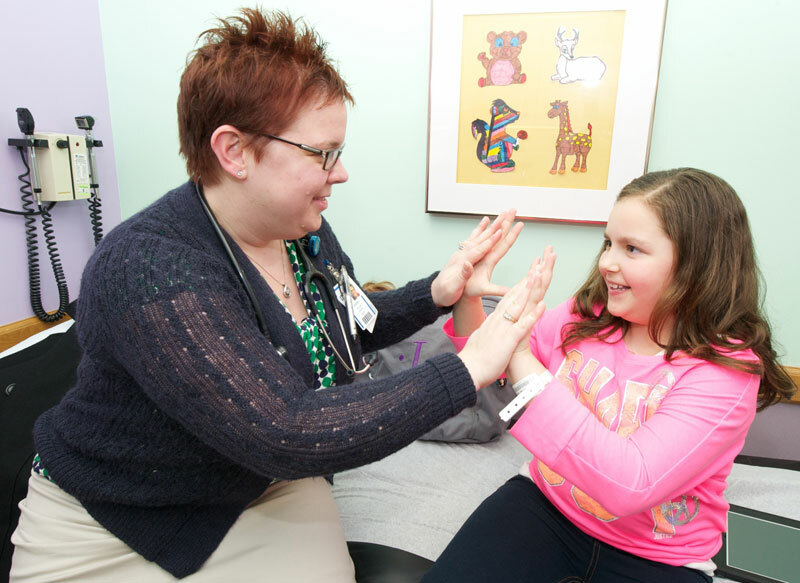 Depending on the patient’s needs, the team at Akron Children’s may include pediatric neurosurgery, neuropsychology, neurology, endocrinology, psychology, physiatry, palliative care, ophthalmology, physical, occupational and speech therapy, and social work. As for Leah, she is getting low-dose chemotherapy and checks in for an MRI of the brain every three months. But she is still in school and playing basketball and soccer. “She can do 100 cartwheels,” says her mom, with a smile. With her 9th birthday coming up, Leah is wishing for her own balance beam to perfect her gymnastic moves at home. We hope Leah gets her birthday wish and we’re sending many more happy, healing wishes her way.